09.05.2006 - Cats in the attic! Cats in the attic! All I keep hearing about is cats in the attic. Meowing and scratching! Prowling and mouse catching! Howling and rat snatching! Well, not howling so much. But yeah, cats in the attic. I remove all kinds of wild animals from attics: raccoons, squirrels, opossums, rats, bats, and even cats. Most of the time, the customer hears scratching and scampering and clawing in the attic. But sometimes they also hear mewing. If they hear mewing, I have reason to suspect that they have cats, for cats howl and mew. If they do have cats, what I do is I catch the cats. I have my methods. Sometimes I place cages baited with cat food, and sometimes I find the hole that the cats are using to enter the attic, and I put a one-way cat door on the hole. The cats go out, but they can't get back in, and then they hiss and scratch and complain, while I softly chuckle. Why are the cats there? They want a safe place to live! They are good at climbing, and an attic is warm and dry. Easy enough. After I catch them, I bring them to the SPCA, and I fix the holes they used to get into the attic, and I clean up the litterbox they've made in the insulation, and the job is done. Cats in the attic! In the above case, the cats were living in an attic of an apartment building. They were climbing up nearby trees (see the tree behind me in the photo) and entering the attic via the roof ducts. I sealed off the ducts and set this one-way exclusion door, which the cats can exit, but not re-enter. I then set traps on the roof, baited with cat food. 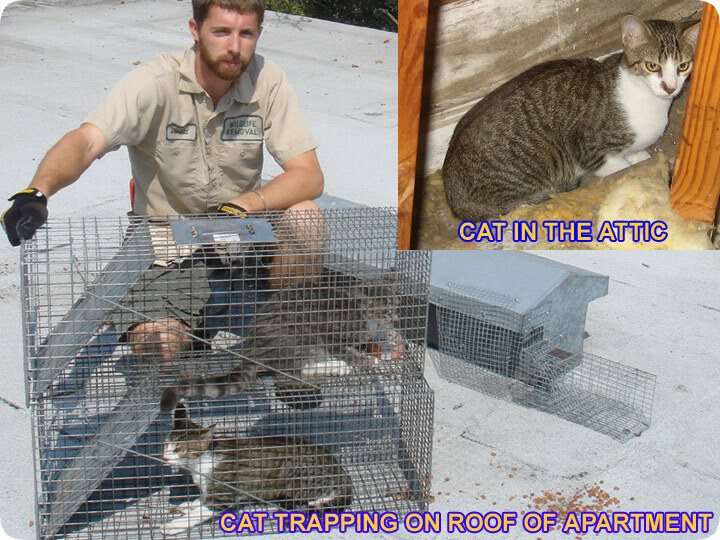 In the inset photo is a shot of one of the cats, the one in the bottom cage, sitting inside the attic. Do it yourself: Visit my How To Get Rid of Stray Cats page for tips and advice. Should you feed a stray dog or cat? It would seem that there are two sides to the story when it comes to the question – should you feed a stray dog or cat? There are some people that think that yes, you should be able to feed a stray pet, especially if you are trying to help it, but then there are others that believe that this is very bad practice, and for a number of reasons. We are going to look into both sides in a little bit more detail so that you can make your own mind up over whether it is right or wrong practice to feed a lost, lonely little animal. We shall start with the case FOR feeding a stray dog or cat: In between finding a stray dog or cat, and returning it to its loving owner, or waiting for the shelter or local authorities to come and collect it, there will be a period of time, no matter of brief, that you will be caring for the animal. It can prove to be rather difficult to get the animal onside, especially when it is scared and frightened, and one of the easiest ways to do this is with the use of food. During this time, using food can easily persuade the dog or cat to be your friend, that you are a loyal and trust worthy individual, and that you are not trying to cause the animal any harm. This could be the difference between a calm, panic free situation, and a scared one where the dog or cat ends up bolting down the street, potentially into the firing lane of oncoming traffic. Technically, with the use of food, you could end up saving the animals life. Another good point in the case for feeding a stray dog or cat if the animal itself is actually a stray and doesn’t have an owner to speak of, is that you will be doing your bit for a poor hungry and frightened creature that would normally be chased away from human gardens and yards, left to pretty much die or scavenge for food. Now we should look at the case AGAINST feeding a stray dog or cat: Now of course, you are going to want to do your bit for the pet to ensure that it is looked after while it is in your care, but what happens if you feed something that goes against the owner’s dietary plan for the dog or cat? Maybe it is an overweight animal and is on a special diet? It could have food allergies or intolerances that you should be potentially making rather dangerous by feeding it. In reality, you wouldn’t feed a baby without first consulting with the parent, so the same thing technically applies for the animal. At the same time, if you start feeding a stray that has NO owner, and that randomly walked into your yard one day, you are going to run the risk of “adopting” the animal regardless of whether or not you want to, and this can be a bad thing if you have other pets to think about. The stray could have diseases which could be spread to your animals; it could also steal your animal’s food away, resulting in fights. In short, the answer to whether or not you should feed a stray cat or dog really does lie with a judgment call, and the current situation that you are faced with.